We’ve been quiet for a few days. That’s because we are totally crunching and stuff -Bumpy Road is pretty much done. We’re just squashing the last bugs and polishing the last few things so it’s all sparkly and super fun and playable when released. So dear Simogo, about that release. When will you release Bumpy Road? 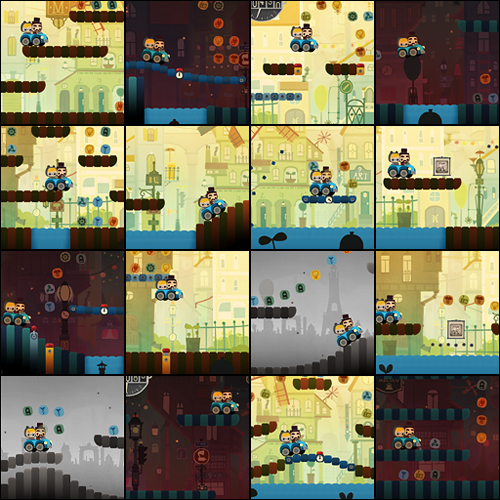 We are very much on track to release the game in May. We’ll make sure to let you know when the game has a firm release date! 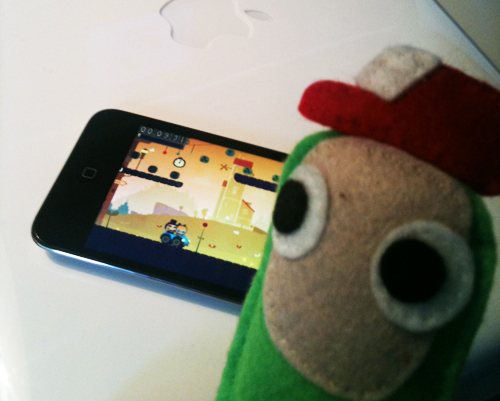 Touch Arcade just posted some impressions of our little game Bumpy Road. They seem to like it. 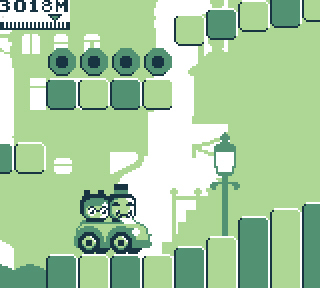 …after playing around with the game for the past few days I’m even more impressed with the mechanic in practice. It works just like you would expect it to from watching the video, and the springy response of the ground manipulation makes for an interesting take on platforming. In addition, there are also special “memories” you can collect, which are photos that unlock in a gallery and tell you the life story of the couple riding in the car. There’s just something endearing about these characters and the entire game in general, and I find myself looking forward to learning more about their lives by collecting photos, which is a unique attachment to have for an endless-style game. 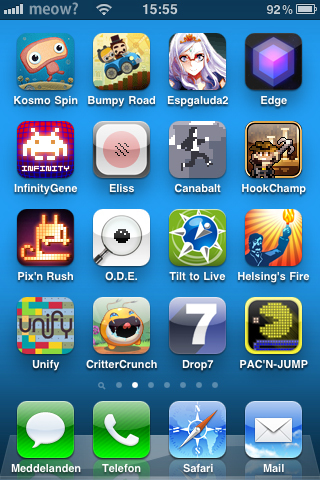 This is how the Bumpy Road icon looks on an iPhone. The hands on impressions for Bumpy Road are starting to roll in! Kosmo Spin has been nominated for Best Nordic Handheld Game in the Nordic Game Awards! Nice. Gordon is building a secret dungeon in the undergrounds of Malmö to store all of our trophies. 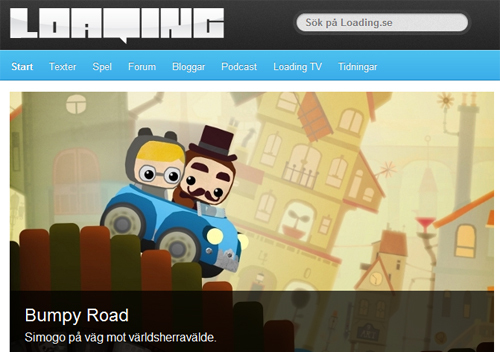 Simogo was interviewed by fine gaming blog Me Gaming. The interview is in Spanish, but if you scroll down, you can read it in English as well. Bumpy Road’s endless mode called “Evergreen Ride” consists of these things we call segments. Think of them as small levels that automatically scrolls by. The longer you play, the harder levels will appear. We just finished the 200th segment of Evergreen Ride. Because we have so many now, every session will be unique! 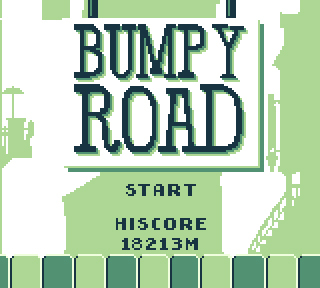 Simogo presents Bumpy Road for Game Boy! 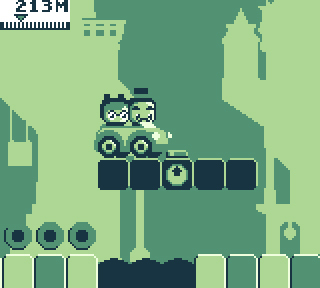 Today is a very special day – We’re super happy to announce Bumpy Road for Game Boy! So, now you’re wondering how to get this. 1. Physical cartridge. We’re discussing this with two factories at the moment. We’ll be needing lots of pre-orders to make this happen. 2. Getting it on the virtual console on 3DS. This makes so much sense, but we’re not sure on the big N’s stand on bringing new games to the service. 3. Offering the ROM for download on the site. It’s going to be a bumpy road, but just hold tight and we’ll let you know how you’ll be able to get your hands on this black & white Simogo love child!